I was in the hospital on St. Patrick's Day enjoying green jello. before it is large enough to cut long stems to bring into the house. perfect for this holiday tablescape. and green napkins add to the different shades green on my tea table. from the Martha Stewart collection from years ago. collection. The spoons have her monogram on the handle. to consume after school this week. Vintage L.E. Smith moon and stars is used for my vase. We can never have to much 'Good Luck' can we? Hope you have a Happy Saint Patrick's Day celebration. on Thursday evening and plenty of leftovers. Such a lovely table Betty! You did a great job with your green design! Thanks for linking this beautiful posting! I am "green" with envy over this table! What a beautiful Irish tablescape. Happy St. Paddy's Day, Betty! Betty, you have set a wonderful St Patrick's Day table! I love all the green and the cute teapot. The green glass teacup is nice too. I do adore green. Happy St Patrick's Day! Visiting from the crawl and following. Hi Betty! Stopping by to enjoy your beautiful St Patrick's Day table! And, how pretty it is! Bright and so spring like with the gorgeous forsythia. Those velvet frosted cupcakes will be so fun for your grandchildren :) They are lucky for sure. Everything is so pretty! I am loving all the pretty shades of green on your Saint Patrick's Day table setting. The green coffee cups and saucers catch and reflect the light beautifully. I am visiting from Kathleen's crawl. HaPpY BiRtHdAy to your Son, dear friend! 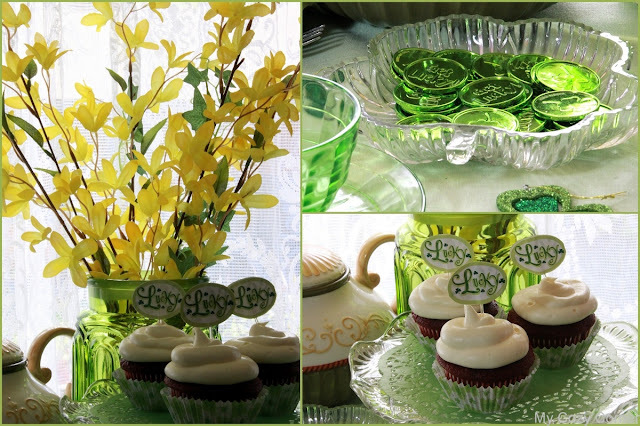 I adore your St. Patrick's Day Tea setting! LOVE the green depression glass cups and saucers! Your small green cabbage leaf bowls are adorable! Love, love, love your St. Paddy's Day setting! Hi Betty, your table is so pretty and so green! I love the color green! Happy birthday to your son! Betty, you have set a beautiful St. Pat's table. I love all the green. I didn't know that MS had a line of cabbage dishes...I have a huge collection of BP dishes. I love all of your lovely green, and that teapot is so pretty! Visiting you from Cuisine Kathleen. Hello Betty! So nice to see your pretty setting! The green glass is stunning. I snipped some forsythia and forced it, love the bright color while waiting for snow Sunday! Thanks so much for joining in the SPD blog crawl! So pretty! Thanks for joining Home Sweet Home!